Founded in 2004, Edinburgh Art Festival is Scotland’s largest annual celebration of visual art. Attracting over 250,000 visits each year, the Festival brings together galleries, museums and artist-run spaces, alongside public art commissions and an innovative programme of special events. During July and August, Central Station is going to publish a series of blogs taking a closer look at what’s happening this year. 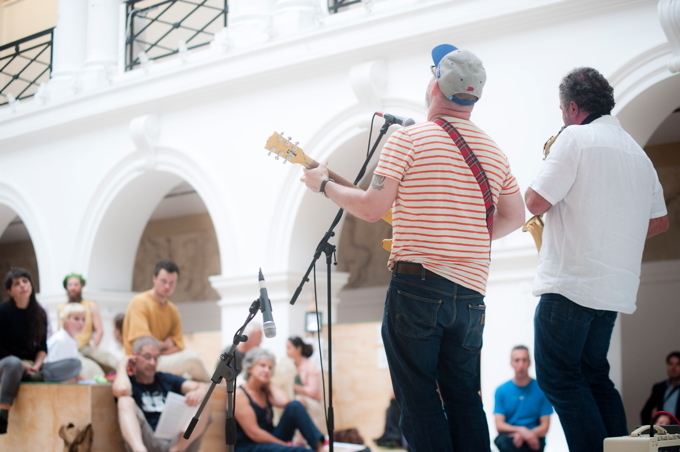 The theme for this year’s Edinburgh Art Festival commissions programme has been Parley. As a result the programme has considered how art can be an agent of discussion, negotiation and debate. Various strands of event have been formed around this notion, led by our commissioned artists and guest speakers. The first Parley Discussion, curated and led by Ross Sinclair, kick-started the festival as an open platform for exploration into discussion and performance with the audience being led through a series of conversations and collaborations. Live art was happening across Krijn De Koning’s Land as speakers such as Maria Fusco presented abstract narratives and explored the notion of Utopia. Performers such as Phoebe Amis lifted the experience with her incredibly high-pitched vocal abilities which echoed across the Sculpture Court. This certainly created an environment that took the viewers out of their initial comfort zones of experiencing visual arts. Lighthearted performances such as this were contrasted with the harsh social realism film Autumn Leaves, created by Kenyerse. The whole experience felt like a whirlwind journey through discursive content which compliments Ross Sinclair’s commission Real Life and How to Live it in Auld Reekie, a series of informative graphics found all over Edinburgh. Ross Sinclair performing at the opening Edinburgh Art Festival Parley Discussion. Photograph by Kat Gollock. For the programme of talks that followed, each artist was partnered with a speaker whose specialty relates to the work in question without necessarily coming from an artistic point of view; this allowed for a huge scope of discussion covering social, political and historical contexts. Robert Montgomery, the artist behind the Edinburgh Fire Poem, spoke with Ryan Van Winkle, poet, performer & podcaster, about their differing use and expression of poetry (Robert’s being bold, visual & public, whereas Ryan approaches the same subject with a personal caution, not intending for all his written words to be widely read). 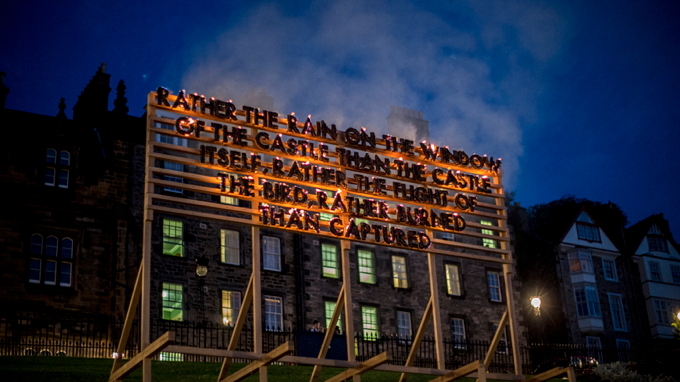 Robert Montgomery, Edinburgh Fire Poem, 2013. Image courtesy of Dael Poulter. Our final commission-based Parley was this week’s “in conversation” between Krijn De Koning, the artist behind the sculptural, architectural intervention Land in Edinburgh College of Art’s Sculpture Court, and Edward Hollis. Edward is based at Edinburgh College of Art and specializes in architecture so the conversation was particularly pertinent. They talked in depth about how artworks unite with the space they are located in; how they can expand the volume and impact of the chosen space. 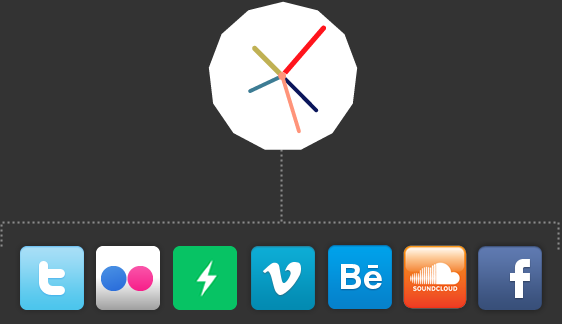 Uniquely, this conversation took place on the work in question. 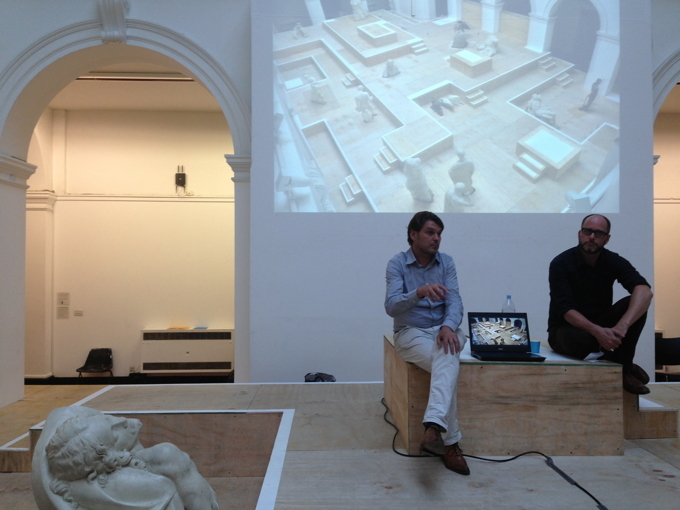 Krijn de Koning and Edward Hollis in conversation on Land, one in a series of artist talks as part of Parley. To see the work used physically and metaphorically as a platform for this conversation was perfectly representative of Parley. Krijn spoke honestly about all aspects of his work touching on the use, or lack thereof, of colour across his works as well as the physical process of transforming such a large piece from initial drawings and model works. We are now sadly drawing to the end of our programme of discussions, but there is one remaining and we are certain to go out with a bang. Parley Discussion: Tae Think Again, Rethinking Identity in Contemporary Scotland, curated by Rachel Maclean and co-commissioned by Edinburgh Art Festival and Edinburgh Printmakers, is this Saturday. 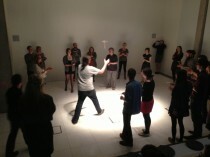 Similar to our opening Parley Discussion, the afternoon will see a programme of performances and speakers. Speakers include Craig Coulthard, David Cameron, David McCrone, Duncan Petrie and Denise Mina and the event will be chaired by Jim Tough with an introduction from Alastair Snow. Expect to delve into the history and future of Scottish identity with the added bonus of a screening of Rachel Maclean’s recent and highly acclaimed work The Lion and The Unicorn. Venue for the Edinburgh Art Festival Parley Discussions. 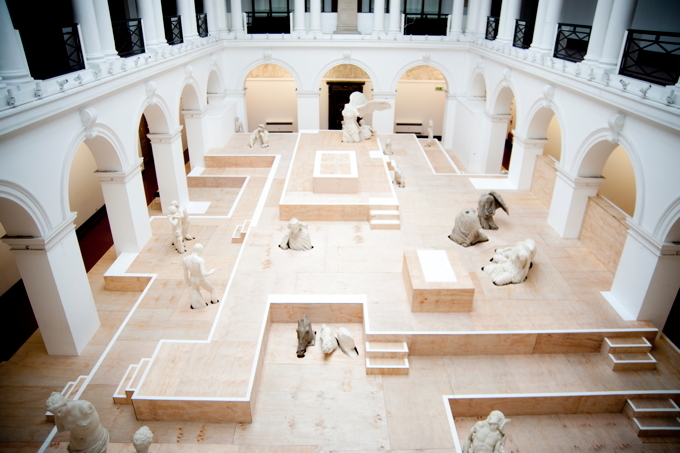 Krijn de Koning, Land, 2013, co-commissioned by Edinburgh Art Festival and Edinburgh College of Art. Photograph by Kat Gollock. Parley Discussion: Tae Think Again, Rethinking Identity in Contemporary Scotland (curated by Rachel Maclean), Saturday 31 August, 2-5pm, free. See more articles by Edinburgh Art Festival here.